November is coming to a close, but I’m still using a lot of brown inks. 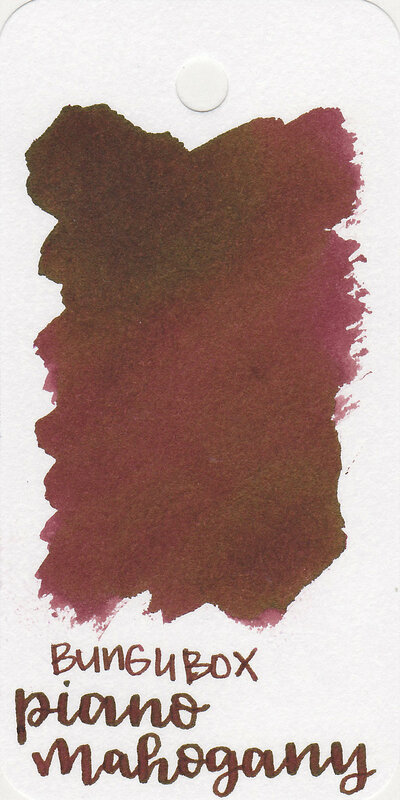 Today’s Bungubox ink is Piano Mahogany. Thanks to Pen Chalet for sending a sample over for review. Piano Mahogany is a dark brown with a heavy maroon undertone. In large swabs the ink looks a lot more purple than it does in writing. There’s some bright green sheen. Other properties: low shading, low sheen, and no shimmer. Piano Mahogany is close to Toffee Brown, but a bit lighter. Click here to see the Bungubox inks together. I used a medium Pilot Metropolitan Retro Pop Purple on Tomoe River 68gsm. The ink had a wet flow. Overall, the ink is pretty well behaved in most nib sizes, but there is some feathering and bleeding in really wet nibs. It dries pretty quickly too.